This week's kerfuffle over the download version of Manga Studio got me and several Twitter followers thinking it was time to explore external storage options for the Surface Pro. It's odd to admit it, but something about the form factor (and perhaps my experience with the iPad) often makes me forget that the Surface Pro is a full fledged, expandable pc too. All of my previous Windows systems have included internal drives and when I've had to install other physical media on the Surface Pro, I've first copied it to a USB flash drive and then installed from that. Frankly, for the amount of times I anticipate needing a DVD drive, that should be good enough. But the fact is that I own a lot of software and content that sits on physical media so I decided it would be convenient to have one around, so long as the cost wasn't too high. 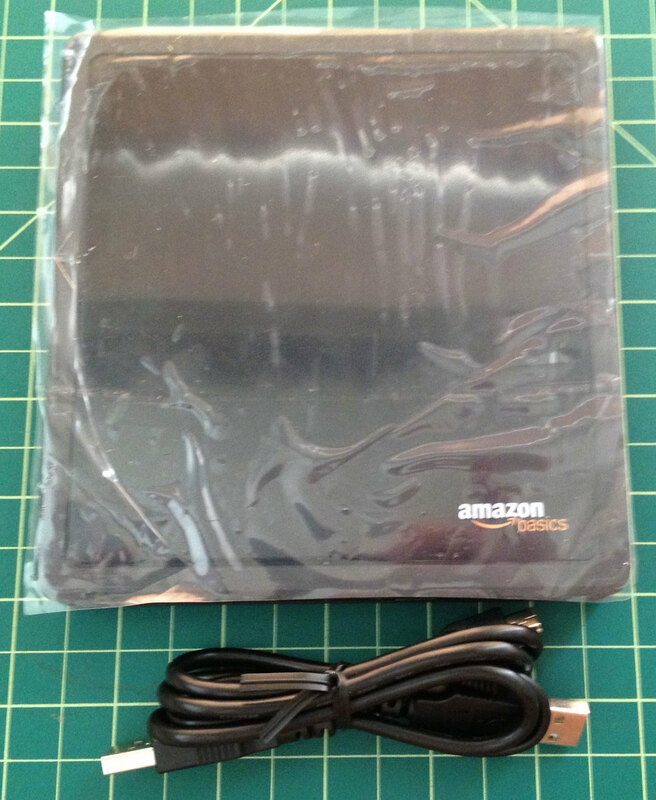 There were a few slightly less expensive alternatives, but figuring it would be easiest to return for a refund should it not work, I settled on the AmazonBasics USB DVD Drive, which costs only $31. Previous external DVD drives I've looked at have all required external power supplies or additional USB ports. And several of the user reviews on Amazon.com complained that a power supply was necessary. But I decided to give the plain Jane drive a try as is. As its name implies, the AmazonBasics drive ships in a plain brown wrapper. Inside the box, you'll find the compact 146.2mm x 140mm x 19mm drive, one USB 2.0 Y Cable (dual type A plug and one mini-B plug), manual and warranty booklets and a CD containing Nero Multimedia Suite 10 Essentials. The Y cable concerned me. I've seen previous cases (on an iMac) where two USB ports are required to power an external drive. 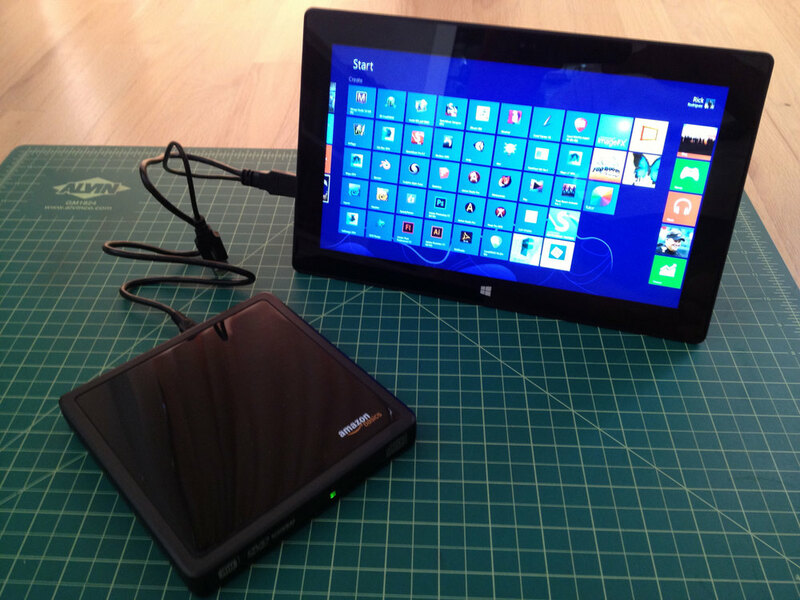 This would obviously be a non-starter, given the Surface Pro's single USB port. The manual doesn't mention the USB port or explain why the supplied cable is a Y. Any theories? As I learned long ago, most software included with hardware is redundant, so I just plugged the cable into the drive and then into the Surface Pro and prayed. Windows and the Surface Pro recognized the drive immediately and I was up and running. To test the unit, I installed a copy of Cinema 4D while running on battery power. No hiccups whatsoever. Since I didn't install the accompanying Nero software, I had to scramble a bit to test DVD playback. I'd forgotten Microsoft's strange decision to ship Windows 8 without DVD playback capability except as a separate addon to Windows 8 Professional. A quick search through the Windows 8 Store didn't cause any obvious choices to rise to the top (can't wait to use 8.1's redesigned storefront). So I settled for the tried and true VLC Media Player. Once again, the drive performed perfectly. My only complaint about the drive is the unnecessary Y cable. As you can see in the image below, one of the USB connectors hangs in an unattractive tangle, adding visual clutter. 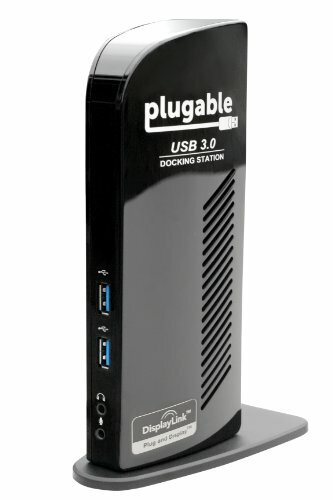 Of course, if you need to use another USB peripheral, you'll be out of luck while the drive is attached, unless you get a powered USB hub. 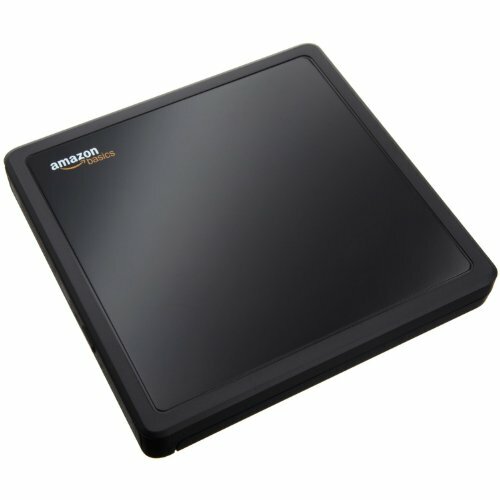 So do I recommend the AmazonBasics drive? Wholeheartedly. Although we're clearly moving to a digital only future, it's nice having an inexpensive option to tap into physical assets and media.